September is finally here and I am so excited for all things pumpkin. 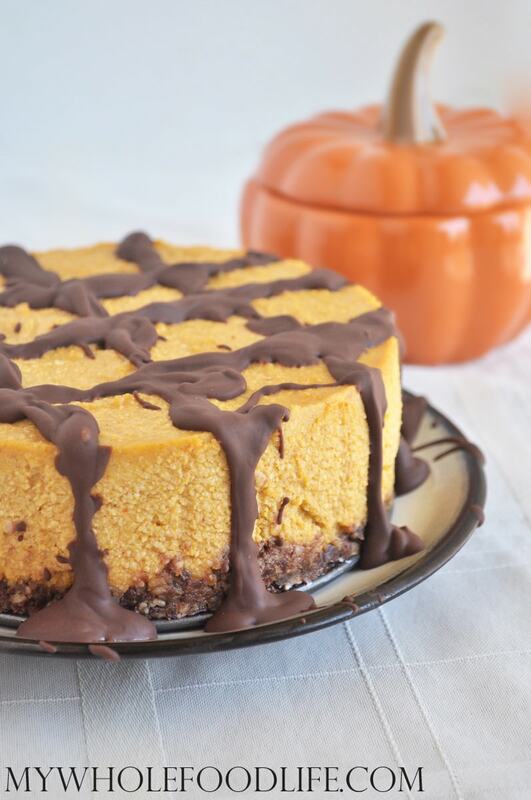 I am kicking pumpkin season off with this amazing Pumpkin Chocolate Cheesecake. This healthier cheesecake is vegan, gluten free and grain free. You can make it super easily too. No cooking required! Pumpkin and chocolate were made for each other! In a food processor , combine all the crust ingredients. You may need to add a tiny amount of water to get the consistency right. The dough needs to come together loosely. Press the crust into the bottom of a greased 6 inch round spring form pan . Place the pan in the fridge. In a food processor , combine all the cheesecake ingredients and blend until smooth. Pour the mixture into the pan and place it in the fridge to set up. It needs about 6 hours to set. Once it's set, you can make the chocolate. Melt the chocolate and coconut oil using a double boiler method. Gently heat the chocolate and stir until it's smooth. Drizzle the chocolate over the top of the cheesecake. Place back in the fridge for another 30 minutes. This should last a couple weeks in the fridge. It also freezes well. Enjoy! Thank you! :) I measure the coconut oil when melted and the cheesecake should be plenty solid enough to slice in the fridge. Did you have an issue with it? I got a 9 inch spring form. Will that work? It will work, but might just be thinner.